Ulu island, center left, in the Duke of York Islands group. NASA Landsat 7 image, 2000. Ulu Island is the second largest island in the Duke of York island group. It is situated between Duke of York Island and Kabakon and Kerawara islands. 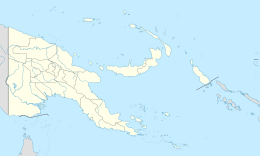 The island is on Papua New Guinea Time (PGT). This works out as UTC/GMT +10:00 hours. They do not observe Daylight saving time. The word Ulu means breadfruit. ^ "Ulu Island". Mapcarta. Retrieved 18 August 2015. ^ "Current Time In Ulu Island, Papua New Guinea - WorldTime.io". worldtime.io. Retrieved 18 August 2015. ^ "Ulu Island, East New Britain Province, Papua New Guinea - Satellite View and Map". satelliteview.co. Retrieved 18 August 2015. This Papua New Guinea–related geography article is a stub. You can help Wikipedia by expanding it. This page was last edited on 19 November 2018, at 20:45 (UTC).